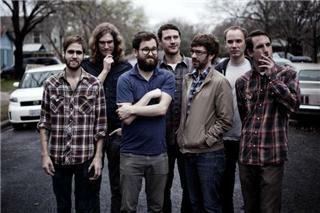 The Eastern Sea is an Indie rock band hailing from Austin, Texas, which originally started as a bedroom project by singer Matthew Hines and eventually morphed into a band. They have released two original full length albums and a full length Christmas album. Created in 2005 as the bedroom project of songwriter/vocalist Matthew Hines. From 2007-2009 the band added several new members and recorded what would eventually become The Eastern Sea, a self-released collection of two eponymous EPs. Songs such as The Snow and The Name attracted the bands first national press and led to several festival appearances. Originally The Eastern Sea consisted of revolving cast of musicians from Austin who joined the band whenever they had spare time similar to the Broken Social Scene situation. Eventually the band focused on creating a more solid lineup but still feature regular guests and contributors.